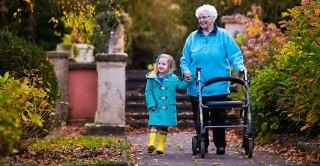 Researchers have failed to find a causal link between children’s development and their relationships with their grandparents. The findings will disappoint policymakers and practitioners working with families, who may believe in the ‘grandparent effect’ – the idea that children’s development is improved when older generations invest in youngsters. But the authors of a new study assert that grandparents can still be important in other ways. Sociologists from the University of Turku in Finland analysed information from nearly 13,800 children born across the UK in 2000-01 who are being followed by the Millennium Cohort Study. They looked at how often the children’s parents and grandparents saw each other, and whether the grandparents provided financial support of any kind. Parents who reported seeing their son or daughter’s grandparents at least once a month had children who performed better on cognitive assessments at ages 3 and 5, compared to those who saw grandparents less than once a year. These children also had fewer emotional and behavioural problems. The findings were similar for families who received financial support from grandparents, compared to those who did not. However, when the researchers looked at individual children’s progress over time, the link between their development and their relationships with their grandparents disappeared. This suggests that grandparents are not the cause of their grandchildren’s positive outcomes. One possible explanation is that children who progress well develop closer relationships with their grandparents. Alternatively, there could be some separate factor that both causes grandparents to be more involved, and children to perform better. The authors explained that a lot of previous research on the so-called ‘grandparent effect’ has been based on cross-sectional data, which can show differences between people, but is unable to prove cause and effect links over time. ‘Grandparental investment and young children’s cognitive and non-cognitive outcomes in the UK’ by Antti O. Tanskanen and Mirkka Danielsbacka is the latest CLS working paper.